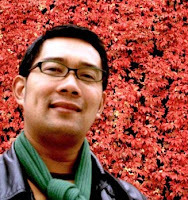 Ridwan Kamil Born in Bandung on October 4, 1971 Emil was the second of five children.Emil actually liked since childhood imagination. He likes to read comics and see photos from various cities abroad after his father. From the latter then a shadow would appear that the city can make people uncomfortable. Moreover since childhood Emil also has entrepreneurial spirit. When elementary school he had sold his homemade ice mambo. During the period of private school known as Emil active and intelligent. Besides active in student council, Paskibra and football clubs, Emil always get the order of five in the class.During his lecture at the Department of Architecture ITB, Emil is also active in student groups and units Sundanese arts activities. Emil entrepreneurial spirit on campus and then grew again, to seek additional funds for college Emil create watercolor illustrations or mockups for lecturers. In 1997 Emil graduated from ITB and chose to work in the United States. But just four months of work he was fired because of the impact of monetary crisis from Indonesia to make the client does not pay for his job. Emil ashamed to go home trying to stay in America, and finally he got a scholarship S2 at the University of California, Berkeley. To survive he felt a meal once a day with a cheap menu for 99 cents and working in part-time at Berkeley city planning department. In the American experience to survive Emil continue to grow when his wife, Atalia Praratya, will give birth to their first child. The father who now has two children had no money, so eventually he had to admit poor at the local city government in order to get free health care.Finally, he accompanied his wife to give birth in a special hospital of the poor, precisely in the ward full of women screaming in pain when giving birth. For him the experience of falling-up that's what her life forming values. Emil is also the author of this blog also claims he will never forget that experience and that's precisely the experience that maketh motivation. In 2002 Emil returned to Indonesia and two years later he founded the Urbane. According to Emil in the first four years Urbane has a target to build a commercial reputation, while the next four years, which means now, Urbane focus on building the urban poor. Problems he had experienced himself. From all his experience that then Emil has a philosophy to live is to give, to live is to give.Urbane Kesusesan himself together at this time he realized just luck because the wheel of life sometimes above, sometimes below. People say that dead people leave a name, but for Emil supreme desire is to die if he left the inspiration, ideas and stories that could be followed by others. By living and has a small office in Bandung (only enough for 25 people), also works as a lecturer and chairman of Architecture ITB Bandung Creative City Forum, Ridwan Kamil break the myth that to be successful to stay in Jakarta, has a large office and must work as a full professional. Together Urbane (Urban Evolution) as a planning consultant services, architecture and design which he founded in 2004, Ridwan Kamil who was familiarly called Emil many works of architecture produced in various countries such as Singapore, Thailand, Bahrain, China, Vietnam, United Arab Emirates and course in Indonesia.Generally the project is a development of the urban area or an area of ​​10-1000 ha called mega projects. Some examples of projects handled Emil such as the Marina Bay Waterfront Master in Singapore, Urban Resort Master Plan Sukhothai in Bangkok, Ras Al Kaimah Waterfront Master in Qatar, as well as the Residential District 1 Saigon South Master Plan in Saigon.While in China there is Shao Xing Waterfront Masterplan, Beijing CBD Master Plan, and the Guangzhou Science City Master Plan. While in Jakarta Emil worked for Epicentrum Superblock Project, from a land area of ​​12 ha was built Bakrie Tower, Epicentrum Walk, offices, retail, and waterfront. Prior to that he also designed them Tarumanegara University Tower I, Al-Azhar International School in Kota Baru Parahyangan, Bandung, and the Grand Tour Community Club House in Jakarta, East Kalimantan Fertilizer IT Center Behind the boards, and much more. The success was coupled with award-winning 20 contests, both with Urbane or private.For example, in 2009 and 2008 Urbane awarded the BCI Asia Top 10 Awards for the categories of building design business. Besides Emil is also a champion in designing the Tsunami Museum in Aceh and won the Creative Young Entrepreneur Award in 2006 from the British Council.